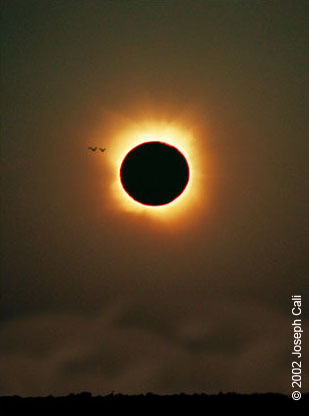 Note : This is an article about the November 2013 Total Solar eclipse across eastern North America, Atlantic and Africa. 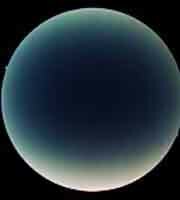 This page has been written for novice and more advanced eclipse chasers. Novices are also advised to look at the "ECLIPSE PRIMER" introductory document first which explains different types of eclipses. 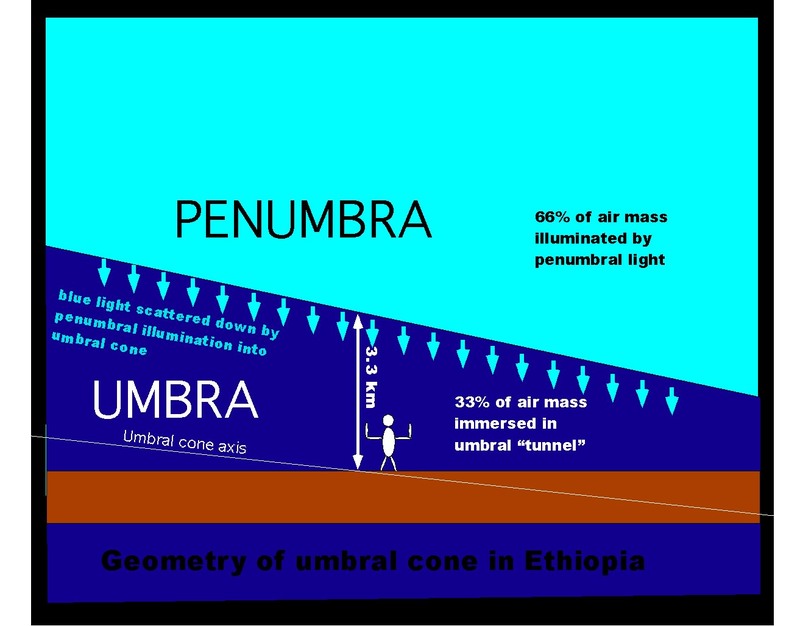 The section on shadow geometry from Ethiopia is for enthusiasts as it requires a bit more understanding. 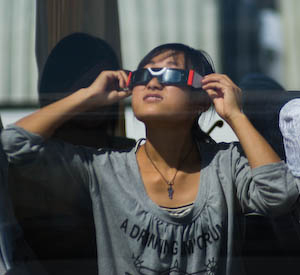 Few people who witness a total eclipse of the Sun, fail to be deeply moved by the experience. Afterwards, they search for superlatives. Phrases such as, "the most spectacular thing I've ever seen" or "mother natures great show," flow from the lips of "eclipse chasers." A hybrid total eclipse will be visible on November 3rd. A hybrid eclipse is a less common type which is annular from one part of the path and total from the remainder of the path. 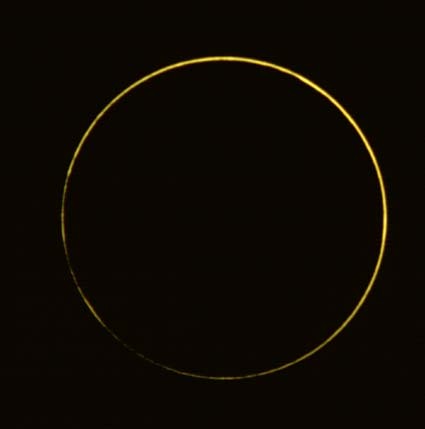 From any one observing location, you experience either an annular or a total eclipse. This eclipse, the tip of the Moon’s conical shadow begins above the Earth’s surface and as it sweeps across, it dips through the Earth’s surface at some point along the path after which the eclipse becomes total. The eclipse will only be visible from solid ground from a small region of central Africa. Africa is the second largest continent by land area on Earth. Coupled with its equatorial position, it is a simple matter of statistics that it also gets a large number of eclipses. 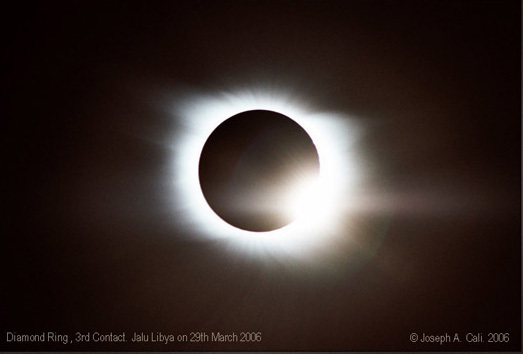 Total eclipses were visible in Africa in 2001, 2002, 2006, & 2013 and the 2020 event finishes just off the African coast. Five annular eclipses cross the continent in the period 2001-2020. The eclipse occurs on Sunday November 3rd. All times quoted in this article are expressed in universal time. Parts of the path in the east Atlantic, west Africa are in the +0hrs time zone. Gabon is in the + 1hr time zone. Uganda, Kenya and Ethiopia is in the + 3hr time zone. The antumbra touches down on the Atlantic Ocean 1000km (620 mi) east of Georgia (30° 26' 46.07" N, 71° 14' 19.57" W). 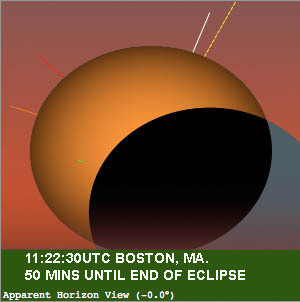 The maximum eclipse visible from continental North America is about 50% partial eclipse at sunrise from the NE USA. A 33% partial is visible at the Georgia coast near Savannah. The following diagrams were generated using Solar Eclipse Maestro by Xavier Jubier. 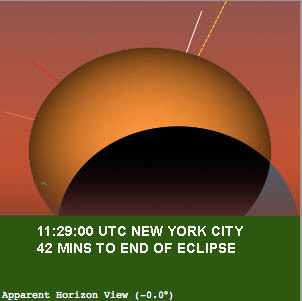 They show the eclipse as the sun is rising and how many minutes of eclipse are visible after sunrise for selected cities on the North American east coast. As the sun rises out at sea on 3rd November 2012, it will rise in annular eclipse from this location and the annular eclipse will last just 3.9s. 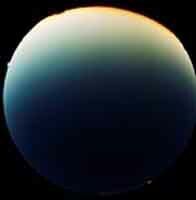 This is short but also spectacular because the obscuration will be 99.89% and only the thinnest of annular rings will be visible rising over and distorted by the ocean atmosphere with many Baily's beads, multiple green flashes and quite possibly a touch of pink chromosphere visible. 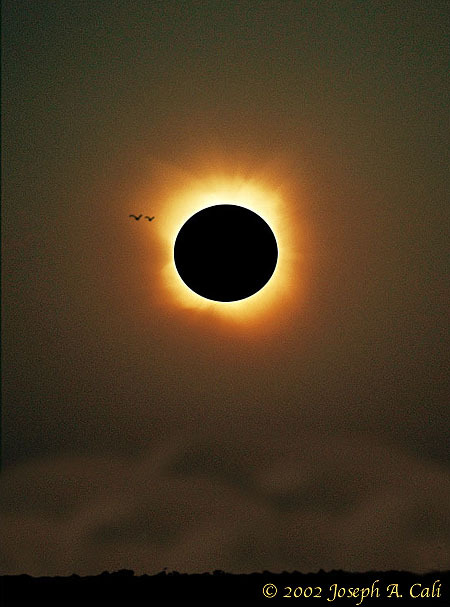 The picture at right was taken during the May 2013 annular eclipse with the eclipse on the horizon, annulus distorted by atmosphere. 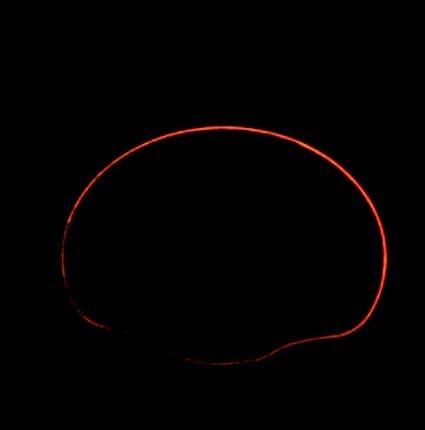 However the November eclipse will be a much thinner annulus, more like the picture below of the February 1999 annular eclipse a 99+% obscuration annular eclipse(left) and the image on the right artistic impression to simulate the appearance as a rising annular some 650km from the Georgia coast. As you travel further east, the annulus becomes thinner and eventually breaks up into a broken annulus before turning total. Once you get to the region of 67W 29E the eclipse approaches zero seconds duration as the sizes of Sun and Moon match each other exactly. 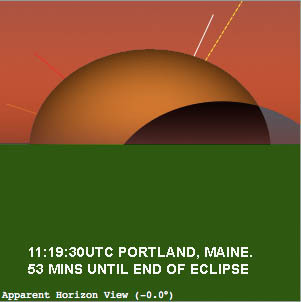 Further east of this point the eclipse will be seen as a total eclipse of increasing duration rather than annular. 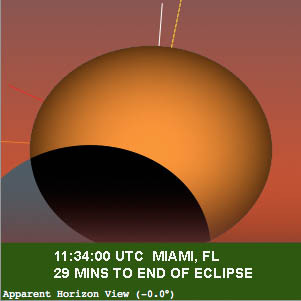 Cruise ships might depart Florida to observe the western end of this event as the sun rises. 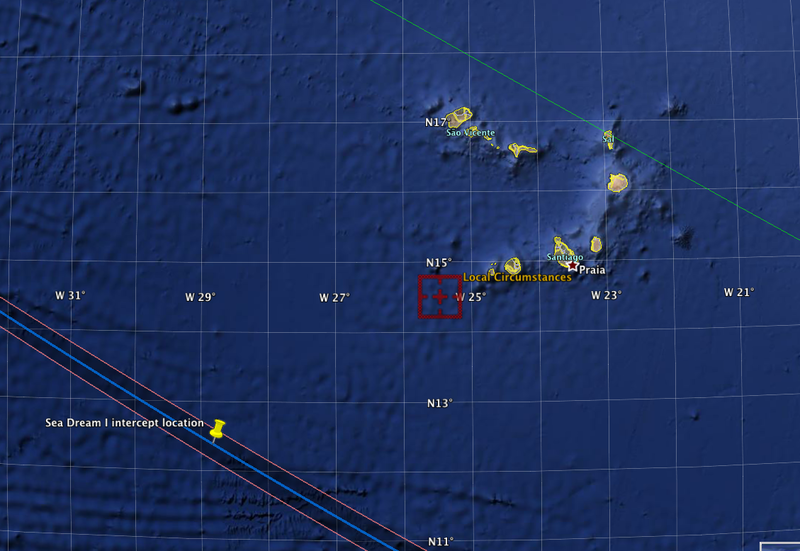 Other specialist eclipse chasing cruise ships will be located further east to observe the total eclipse from the central or west Atlantic Ocean. I am taking part in Paul Maley’s expedition. Our yacht, the Sea Dream 1 will be located 650km(400mi) SW of Cape Verde from where we will see a bit more than 1 minute of totality high in the sky. The many islands of Cape Verde are located out of the path of totality but the islands will witness between 80-90% partial eclipse depending upon location. 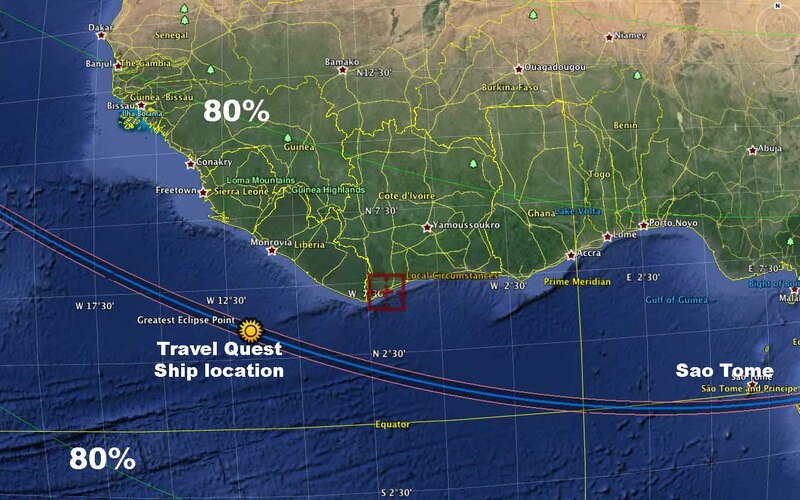 The Travel Quest Ship will be located in the vicinity of the greatest eclipse point very approximately 330km (200 mi) SSE of Monrovia. All the countries of the southwest coast of north Africa, once referred to as the Ivory coast (encompassing from Senegal south and east around to Cameroon, will experience in excess of an 80% partial eclipse in the early afternoon of November 3rd. The southern tip of Sao Tome and Principe Island will see a 99.4% obscuration eclipse. 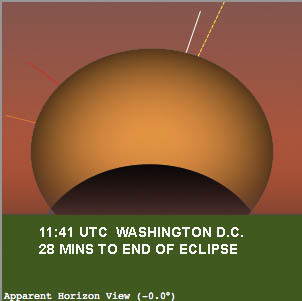 It is just 25km (14mi) from the northern limit of totality. Observations made outside the eclipse path in Australia last year indicate that the umbra (Moon’s shadow) may be seen traversing the sky from this location however it is very unlikely that corona will be observable to the naked eye. It may be possible to the same techniques use to photograph corona and chromosphere during annular eclipses, however there are easier ground locations to travel to. This map is a low-resolution illustration and only intended to show the relative positions of places mentioned in the text. Some observers are heading for Gabon in search of longer eclipse duration. Weather prospects in Gabon vary depending on location some similar to Kenya / Ethiopia other areas of Gabon are worse. Other land based observers are heading for the west end of the path where the tourist access is better. On first inspection duration is very short 3-16 seconds, the path is narrow and the eclipse circumstances don't look ideal. If you think of eclipse observing as just looking at the obscuration of the Sun's disk then this may well be true. 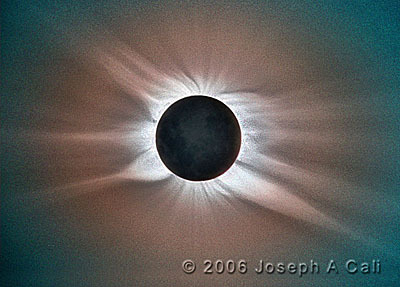 At the end of the path, the whole sky becomes one big spectacle as the lunar shadow creates a spectacular "tunnel of shade" caused by the combination of perspective and the narrow shadow as can be seen in this picture of total eclipse 2002 taken by Bengt Alfredsson. We were on a sand dune, 160km from the end of path with the Sun perched 2.5 degrees above the horizon. At the same eclipse, I took these fish-eye pictures. 160 degree angle of view camera looking straight up, eclipsed sun just out of view at the bottom. 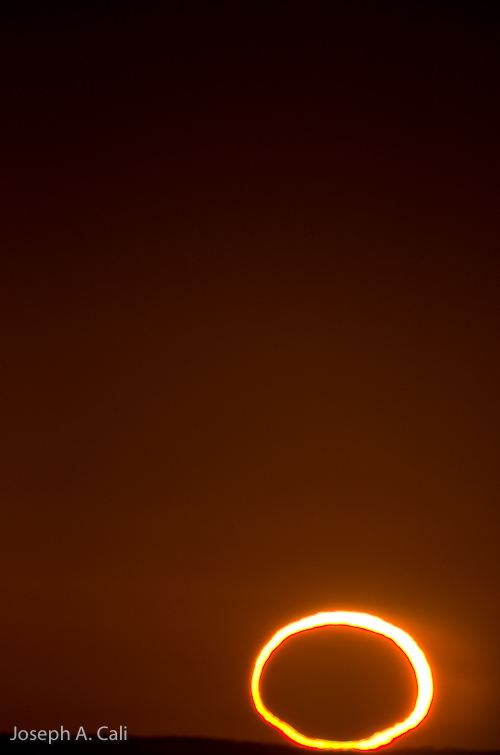 At the same eclipse, I shot totality, sun 2.5 degrees above the horizon. On the left is a composite, extracting as much corona as possible from a handful of exposures taken during 25s of totality. On the right, a single image showing the nearly same sized Sun and Moon with prominences and chromosphere spilling around the limb. The umbra in 2002 was 20km diameter at our location. The umbra is smaller at this eclipse. It will be fascinating to see the results of observations in east Africa. Here is my view on the potential downside. In eastern Ethiopia, the shadow is just 6.5 km wide and passing overhead at an average speed of around 40000 km per hour. Sunlight will be visible outside the umbra 3.3 km to the north and south and above. However there may be some scattered light in the tunnel of shade coming from the sunlit sky above. 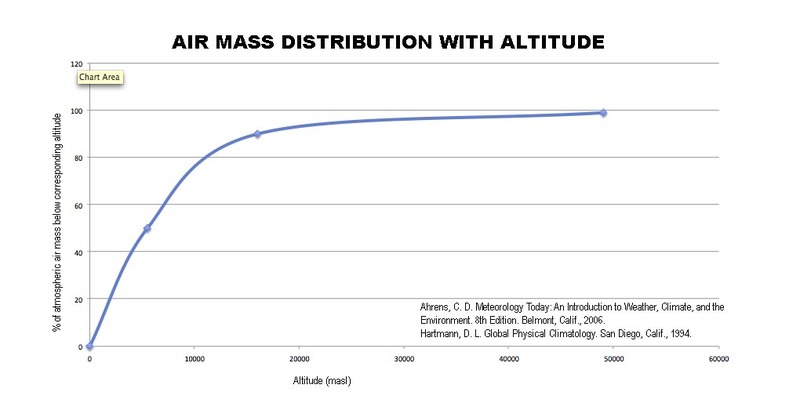 Consider air mass distribution with altitude, a very rough plot is presented here. At mid eclipse, the axis of the umbral cone passes through the observer, penumbral sunlight striking the air 3300m above the observer will result in scattering of blue light downwards (see diagram below). This light is not illuminated by full intensity sunlight. Intensity of this light (in deep partial eclipse) is approximately 1% that of full sunlight however a full 2/3 of the air mass lies in the penumbral light. The visibility of the "tunnel" will be determined by whether the light scattering from the multiple air masses seen above the horizon to the north and south is visibly brighter than the penumbral light scattered down from the 66% air mass above the umbra. At Lake Turkana in Kenya, the umbra is some 14km diameter. At mid-eclipse ( 16s totality duration), the umbra extends 7000m above ground based observers. The umbra encompasses 66% of the air mass. 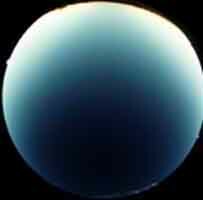 33% of the air mass lies above the umbra also scattering blue light down towards observers. The contrast between tunnel and north and south horizons should intuitively be about twice that of Ethiopia. 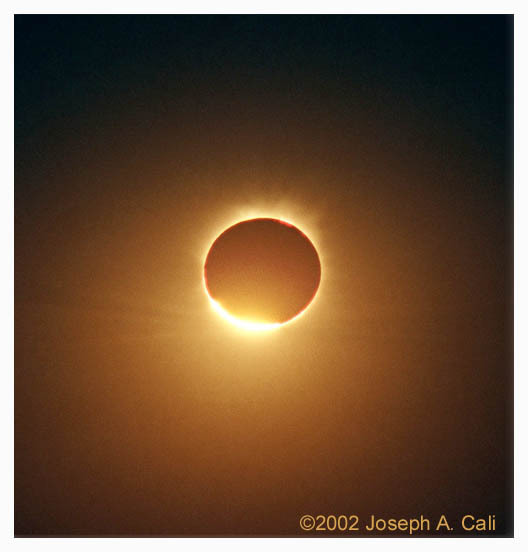 In 2002, the tunnel effect was very evident from the eclipsed sun in the west overhead and out to the east because there was a high contrast ratio between extra-umbral light visible to the north and south and umbral shading overhead. I predict that those contrast ratios will be much lower in Kenya /Ethiopia with the lowest contrast ratios in Ethiopia. I look forward to seeing observers results and hopefully hearing reports about contrast ratios and tunnel visibility especially from people who were at Lyndhurst or Cameron Corner in 2002. High resolution maps and predictions of all eclipse paths are available from the web site links provided at the end of this document. November isn't the sunniest month of the year in equatorial Africa. I have presented very simple statistics only in the article above because there are sites that deal with this aspect in great detail. Jay Anderson is a Canadian Meteorologist who publishes a web site that specializes in eclipse weather. 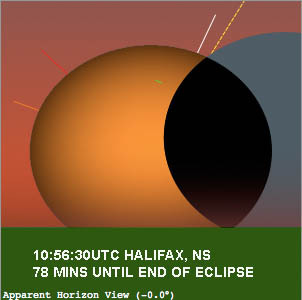 His site is http://www.eclipser.ca He has a whole section about weather prospects for this November's eclipse. Thanks to Jay Pasachoff, Geoff Sims for suggestions and feedback on this article. 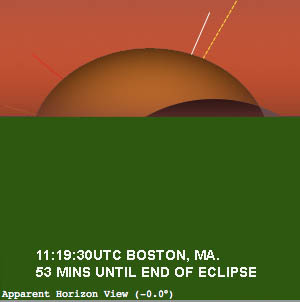 Detailed maps and eclipse ephemerids can be downloaded from the NASA eclipse home page maintained by Fred Espenak. 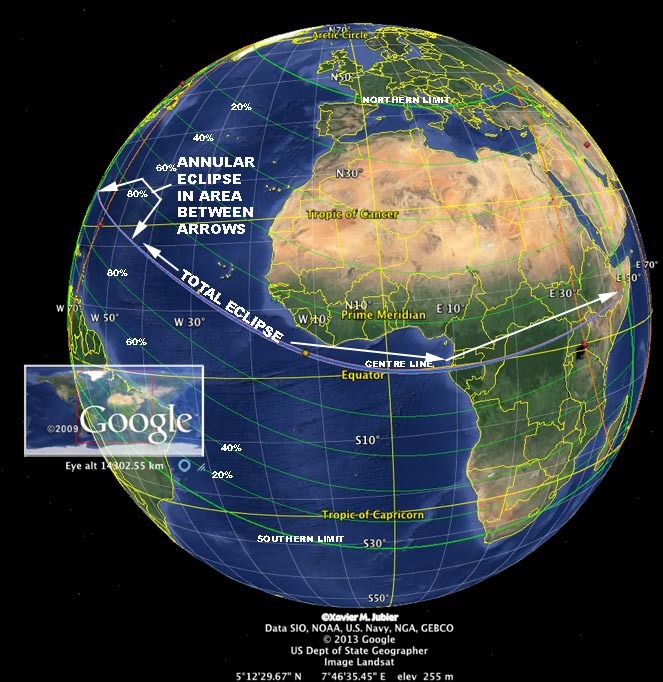 If you have Google Earth on your computer, eclipse paths (.kmz files) can be down loaded then overlaid onto Google Earth from Xavier Jubier's web site. These come with an interactive tool that calculates eclipse circumstances for the point at the centre of the screen. 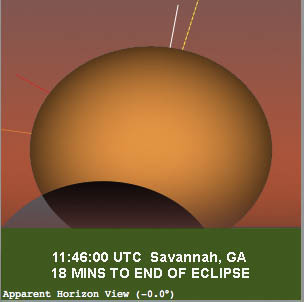 Solar Eclipse Maestro Software is also available at his site.